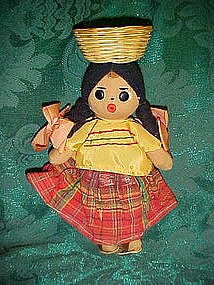 Old cloth souvenir doll is stuffed with sawdust, She is from Mexico or Central America, She wears Central America costume complete with sandals and a basket on her head. Overall including basket she measures 9" tall. She is in great condition!